Most people think popularity is one of the most important things in investing. On Bloomberg article on August 16th week, these top five popular mutual funds are unveil. With the stock market and financial economy in chaos for the past 2 years especially during the period of end of 2008 until early 2009, investors and/or traders have tried to invest in most popular mutual funds as well the cost effective mutual funds. With the stock market drop around 50-80% of value, most bond mutual fund has increase in value. To no one surprise, the most popular mutual fund is Pimco Total Return. Also, two of index funds from Vanguard also landed in the top five of this list. For complete list the following is top five popular mutual funds. To no one surprise Pimco is number 1 in top 5 popular mutual funds. 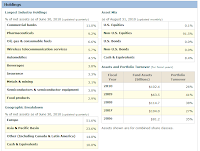 Pimco Total Return has continuously the leader in bond fund. The mutual fund objective is to seek maximum total return, consistent with preservation of capital and prudent investment management. There are various classes for this bond fund whether it is for individual investor or institutional investors. Some may provide better expense ratio and or no load etc. The lead manager is William H Gross also known as Bill Gross since 1987. Bill Gross is a well known bond guru in investing world. The primary portfolio consist of intermediate term investment grade bond either government bond / treasury, mortgage bond, investment grade corporate bond, high yield corporate bond, emerging markets, municipal bond and other instrument. If you choose this fund, please note that some fund classes have a front end sales load of 3.75%. This fund is also offered in most 401K fund selection. In my 401k account, I can choose Pimco Total Return with PTTRX ticker. This class of fund doesn’t have any load Front End Sales Load. Other tickers of Pimco Total Return fund are: PTTAX, PTTBX, PTTCX, PTTDX, PMBIX, PTSAX, and PRFAX. As one of the biggest asset mutual fund, no one will surprise with the popular of this American Fund. The fund objective is to provide growth of capital. It also can invest wherever the best growth opportunities may be (about >65% in common stocks & < 25% foreign stocks). This fund also is being offered in various classes for individual investor or institutional. If you choose this fund, please note that some fund classes have a front end sales load of 5.75%. The fund is managed by James E. Drasdo, lead manager and by portfolio counselor such as Donnalisa P. Barnum, Gordon Crawford, James F. Rothenberg, Gregg E. Ireland et all. The primary portfolio consists of growth stocks. 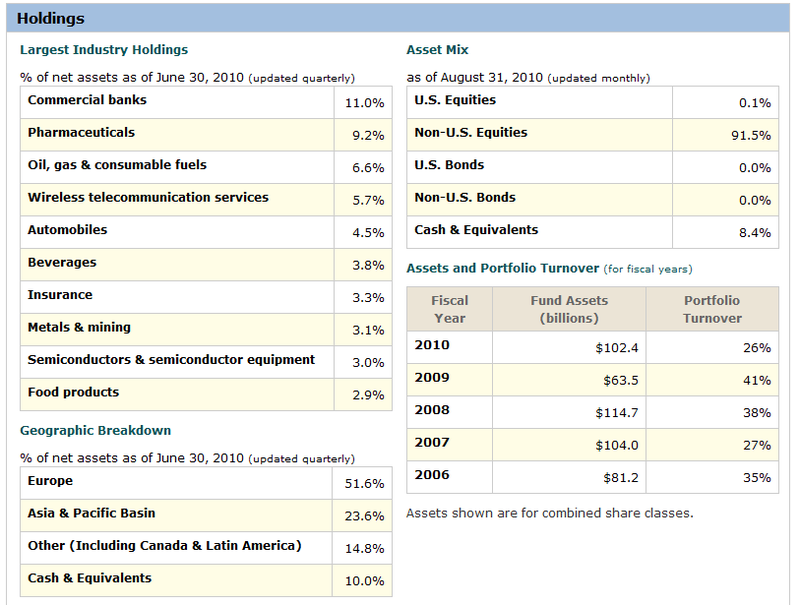 The top 3 sectors of fund as June 2010 are Oil & Gas energy sector, software technology sector and Metal & mining sector. Top 10 largest equity holdings for this fund include Google, Oracle, Microsoft, Apple, JP Morgan Chase, Barrick Gold, Cisco systems, Union Pacific, Apache, and Suncor. The Fund seeks to track the performance of a benchmark index that measures the investment return of the overall stock market in US stock market (MSCI US Broad Market Index). The fund Invests in more than 3,000 stocks representative of the whole U.S. market. As Typical Vanguard fund, Vanguard Total Stock Market also has a low expense ratio. As a conscious investor, low expense ratio can be a good thing in a long term investment strategy; this means more return for us the investor. The fund is being managed passively by Gerard C. O’Reilly. As typical vanguard fund, this fund is classified as index fund. The primary portfolio consists of large cap blend stocks. 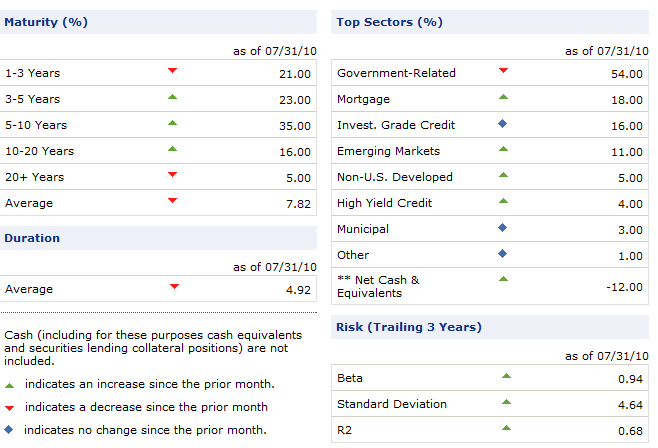 The top 3 sectors of fund as August 2010 are Technology, Financial and Healthcare sector. Top 10 largest equity holdings for this fund include Exxon Mobil, Apple, Microsoft, Procter & Gamble, General Electric, International Business Machines (IBM), Johnson & Johnson, JP Morgan Chase, AT&T and Chevron. The fund’s investment objective is to provide long-term growth of capital. The fund invests primarily in common stocks of issuers in Europe and the Pacific Basin that the investment adviser believes have the potential for growth. It normally invests at least 80% of net assets in securities of issuers in Europe and the Pacific Basin. If you choose this fund, please note that some fund classes have a front end sales load of 5.75%. The fund is managed by a lead manager, Stephen E. Bepler as well as portfolio counselors. This fund is also offered in most 401K fund selection. In my 401k account, I can choose American Europacific Fund with REREX ticker. There is no front end load for this fund class. Other tickers of American Europacific Growth fund are: AEPGX, AEPCX, AEGBX, CEUFX, CEUCX, RERCX, RERFX, CEUEX, AEGFX, RERAX, CEUBX, REREX, RERGX, CEUAX, and AEPFX. The primary portfolio consists of large cap foreign growth stocks. 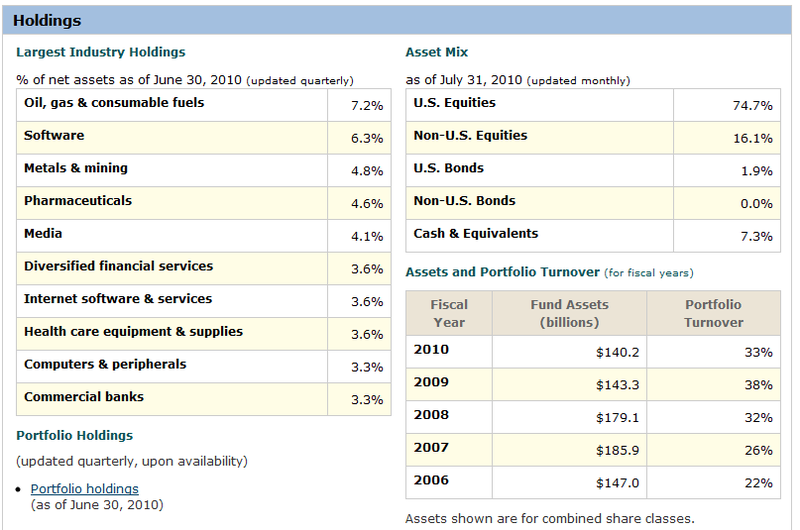 As of August 2010, the top 3 sectors of fund as August 2010 are Financial, Healthcare and Energy sector. Top 10 largest equity holdings for this fund include America Movil, Anheuser-Busch InBev, Novartis, Novo Nordisk, Bayer, UBS, Daimler, Nestle, Roche, and Softbank. This is another vanguard mutual fund offering which tracks S&P 500 index. The investment objective is to track the performance of a benchmark index that measures the investment return of large-capitalization stocks (i.e. large company). As typical vanguard fund, this mutual fund is also a passive management or indexing investment approach designed to track the performance of the Standard & Poor’s 500 Index, which is a widely recognized benchmark of U.S. stock market performance that is dominated by the stocks of large U.S. companies. The fund is being managed passively by Michael H. Buek. Where can I purchase these mutual funds? Scottrade – Offer various mutual funds. 3,000 No load & No Transaction Fees (NTF) fund for free and 15,000 mutual funds as well as trading account for $7.00 per trade. You can buy the American Fund family for free and please select no load fund. Zecco – Offer various no load mutual funds for $10.00 as well as broker trading account with free 10 trades per month with >$25k balance. Disclaimer: I have no affiliation with any of these mutual funds. I also have no position in any of these funds. Please do your own research for additional details. Please trade and invest responsibly. Past Performance is No Guarantee of Future Results.